Mimas, with the Herschel crater clearly seen. Image made of six images taken by Cassini on February 13, 2010, when Cassini was 9,500 km away. Mimas (from the Greek Μίμᾱς) is one of Saturn's largest moons. It is also called Saturn I. Mimas is best known for its large crater, Herschel. In the centre of the crater is a very high mountain. 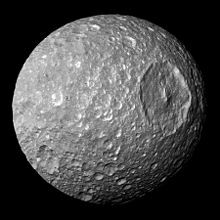 Mimas was discovered by the English astronomer William Herschel on September 17, 1789. The moon is believed to have created the Cassini Division. This is a 4,800 km gap between Saturn's A and B rings. Mimas was discovered in 1789 by William Herschel. He discovered it on September 17. Herschel discovered it along with another Saturnian moon, Enceladus Mimas was named after one of the Titans in mythology. Mimas was the giant. Mimas is full with craters like our Moon. But unlike the craters on the Moon, Mimas has icy craters like going through an icy object. Mimas has craters, but the most famous is the Herschel crater. It is 130 km (80 mi) in diameter. The diameter of Herschel is about 1/3 of Mimas. If a comet or asteroid that hit Mimas were to hit Earth, the crater would be seen from space with all the Earth shown in view. Mimas would evaporate away if it was too close to the Sun. Mimas has been visited by 4 or 5 spacecrafts. ↑ "NASA: Solar System Exploration: Planets: Saturn: Moons: Mimas". ↑ 2.0 2.1 How it Works Book of Space. Imagine Publishing. 2010. p. 114. ISBN 9781906078829. This page was last changed on 2 August 2018, at 01:34.